Who is going to come to the rescue when kids (and maybe even adults) have chosen unhealthy things to eat? Captain Vegetable, that’s who! This song was written by Jeff Moss for Sesame Street and helps kids learn about choosing healthy vegetables to eat. Captain Vegetable has as his trusty sidekicks carrot and celery, and when he meets up with a kid who is eating candy and a kid who is eating spaghetti, he encourages them to change their ways. Come to one of our concerts in April (the 12th and the 19th) to see our kids have fun in their rendition of Captain Vegetable. Here’s Captain Vegetable on Sesame Street. 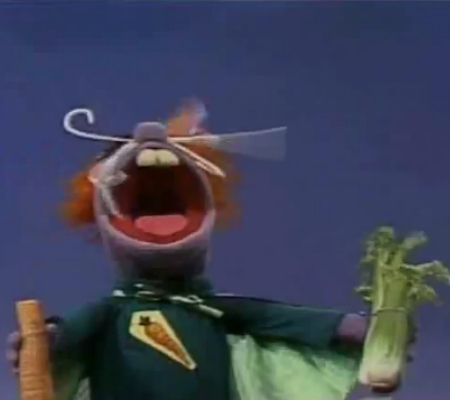 Three cheers for Captain Vegetable! *featured photo is a screenshot of this YouTube video.